Here is your chance to get your hands on a brand new HK Army KLR Mask thanks to Blades and Triggers. 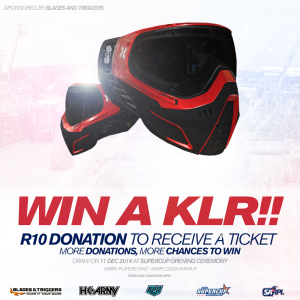 For each R10 donation to help us with Paintball Super Cup 2014 you get one ticket into the draw to win this awesome mask. Electronic tickets will be created for each R10 donation received and allocated according to your APPA ID. During the Opening Ceremony at Paintball Super Cup 2014 on Thursday 11 December one ticket will be drawn and the prize will be handed over to the winner.